The pumpkin patch is a great place to hold a birthday party! You will have a party coordinator there to assist your group and a private outdoor party area for your group to gather. Parties are scheduled to last 2 hours but you are welcome to stay as long as you would like at the patch. Tables and party area will need to be cleaned if there is another group arriving. You can also arrive up to thirty minutes before the party to decorate the tables and porch area. We will have four 6 foot tables at the party: 2 are typically used for guests, one for presents and one for food. You are welcome to bring cake, refreshments, food, decorations or any other approved activities to the patch the day of the party. 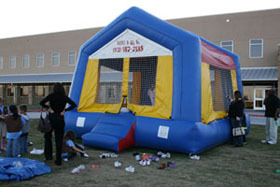 During your party you will have the bounce house to yourself for a 30 minute period of time. After that it is opened up to other visitors. Your group will also have a private hayride, designated time in the hay maze and time for pictures, games and refreshments. Each child will receive a mini pumpkin to decorate and a fun tattoo as party favors. The cost is $10 per child, or a minimum of $150 for the party. Adults are free. A $75 deposit is required to confirm your party date/time. 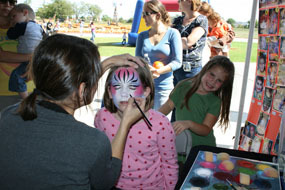 Additional options include a designated 30 minutes with our face painter ($50) or 10 pumpkin launches ($50). An additional deposit is required for these options and must be scheduled at the time you book your party. If it is raining on the day of your party, the party will continue. If light drizzle, we will continue with outdoor activities as we can. If raining harder, we will move the party indoors still doing pumpkin games, a fun tattoo and crafts. The face painter is included for free on rainy days. Contact Laura Echols-Richter will be the contact at [email protected]. 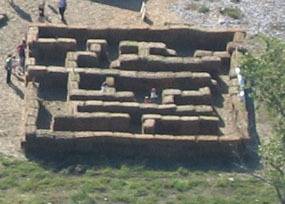 We host field trips Monday through Friday. Kindergarten classes can enjoy rotating through 6 learning stations while they spend the morning in the pumpkin patch. Field trips are scheduled from 9:30 a.m. to 12:30 p.m. The cost is $6 per child. If your Kindergarten class is interested, please contact Melissa Eigenmann at [email protected]to be added to the wait list.